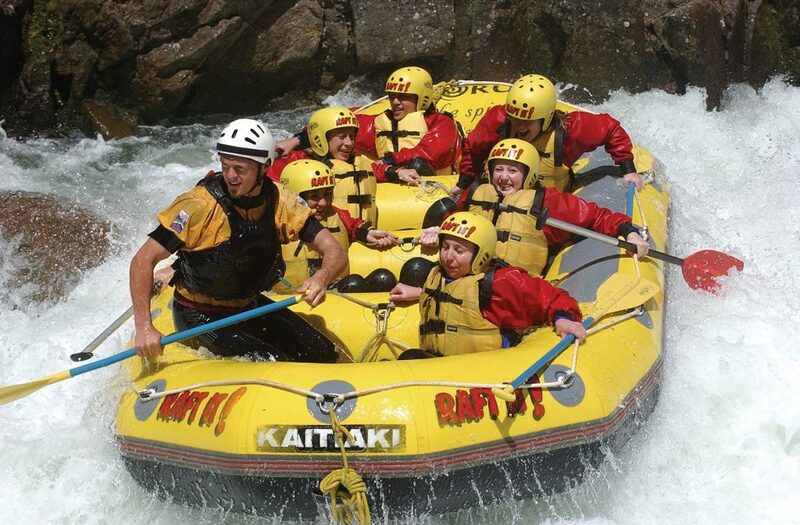 White water rafting has made it to many bucket lists. If it’s on yours and you find yourself ready to take the plunge, here’s a few behind the scenes tips for first-time white water rafters. You can watch countless numbers of videos and read guidebooks on white water rafting, but nothing can prepare you for the real thing. It’s not what you expect it to be. It will go beyond your expectations and be so much better. The roar of the rapids as you charge down the river, rough and smooth at the same time and the mix of excitement and fear of the unknown all at once, it’s indescribable really. The big question is, will you squeeze your eyes shut or keep them wide open as you brace yourself for the 7-meter Tutea Falls drop? How to paddle as a boat together, who will sit where and why, what happens if someone falls out – these are all common questions that will be addressed during your safety and training session. You will learn a range of techniques needed to safely manoeuvre your boat in different scenarios. Safety comes first, and the fun comes later. White water rafting for the first-time is a big deal. Unless you’re already in a big group or have a pre-arranged booking, you will likely meet new people who will be sharing this once-in-a-lifetime experience with you. Luckily, you will go over the safety training and videos together as a group and get some time to bond on the bus ride over and back. But there’s also something to be said about those final moments, just before you all get in the water, marching in matching wetsuits (and realising how surprisingly easy it is to move in all that foamed neoprene) with your arms stretched above carrying the boat overhead – there is something in the air that ties you all together, seconds before you dive in and take the plunge. The only thing you need to bring is your swimwear. Because everything else will be provided to you including life jackets, boots and helmets. Starting off with an initial fleece base and wetsuit you can also choose to add an outer shell with colder temps. Most importantly, you learn how to easily put on a wetsuit and rock the look. Be it summer, spring, winter or autumn, your white water rafting gear will keep you warm but not necessarily 100% dry. Because you will most definitely want to get wet. Not just for the photographs, but for the thrill and feel of it all. New Zealand follows the international river grading system. 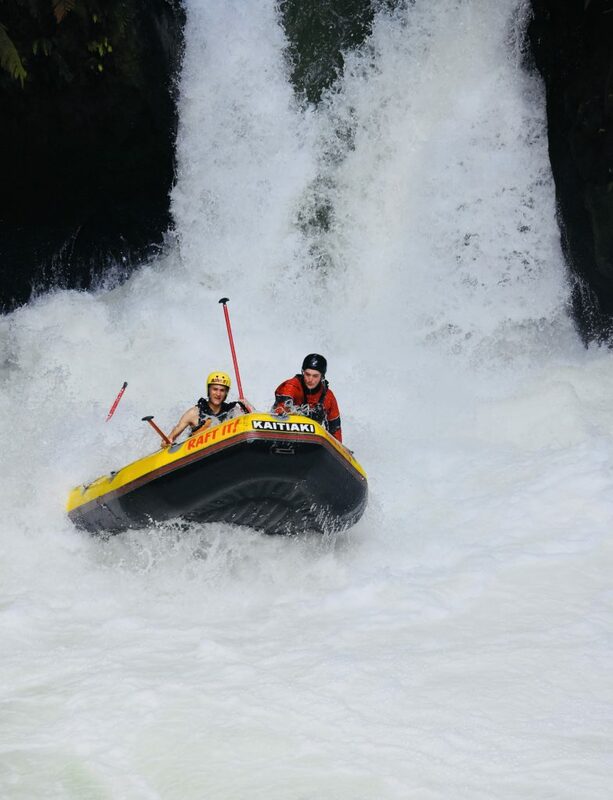 Our white water rafting tours range from Grade 3 – Grade 5 rapids. 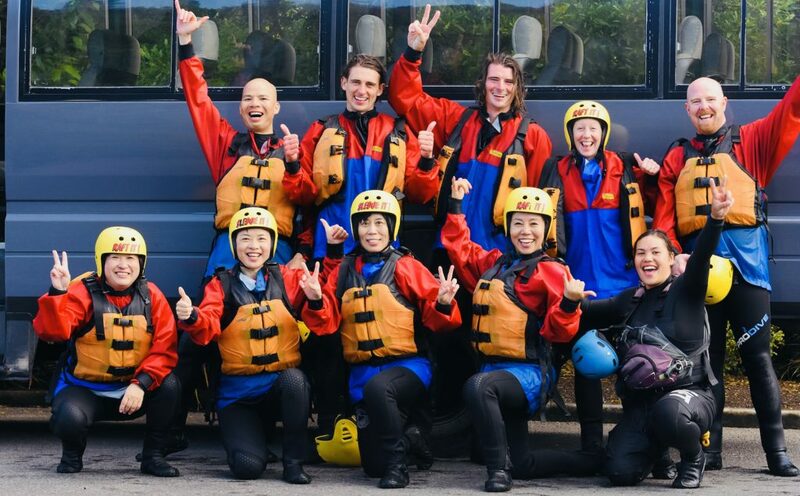 As New Zealand’s first Qualmark gold-rated rafting company, you can trust that you are in the best, most competent hands. You will feel exhilarated, challenge yourself, test your limits but at the same time feel super safe. No phones, water bottles, towels or personal effects with you, as these will be stored safely back at Kaitiaki Adventures HQ. Out there, it’s just you, the boat, your amazing guide and some new mates. You will see things from a totally different perspective bopping around on an inflatable boat along the river. And you will capture those moments with your bare eyes, not behind a camera lens. No need to fret, because there will be an adventure photographer on stand-by at key points to get the best footage of your first-time white-water rafting. After your first white water rafting experience, you will be left with wanting more. More rapids, more falls, more time in white water. It’s as if this was just a teaser into the wonderfully wet and wild world of white water sports. It may very well lead to new adventures like white water sledging, aka hydrospeed, which takes the boat completely out of the picture so it’s just you vs. the elements. Whatever you decide next, remember to enjoy every second you have out there because these are the moments to live for. A Gold Award recognises the best sustainable tourism businesses in New Zealand, with the delivery of exceptional customer experiences an integral part of everything they do. A Gold Sustainable Tourism Award identifies those businesses leading the way in making the New Zealand tourism industry a world class sustainable visitor destination. Outdoorsmark – OutdoorsMark is the national outdoor safety audit programme designed by the New Zealand outdoors community for the New Zealand outdoors community. Establish procedures for continual review and revalidation.